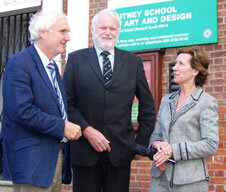 Edward Lister, Jim Maddan and Rosemary Torrington Councillors, Thamesfield Ward, Putney, Wandsworth Borough Council. Welcome to this edition of our e-bulletin which we hope you find helpful and informative. We plan to continue to publish a regular ebulletin covering Council news and issues during 2011. Many constituents already receive this direct by email and we are happy to add new subscribers. Thamesfield residents can also contact us direct by email to raise any case work matters – elister@wandsworth.gov.uk; jmaddan@wandsworth.gov.uk; rtorrington@wandsworth.gov.uk. Due to time pressures we cannot monitor local websites and or guarantee therefore to be familiar with issues raised in this way. The Environment Agency has announced plans to refurbish Ashlone Wharf - an important flood defence structure which manages the flow of water between Beverley Brook and the River Thames which is tidal.The project is expected to start in April this year, lasting until December. The wharf, which is located to the south of Barn Elms Playing Fields and on Beverley Brook is in a poor condition and requires urgent repairs. Engineers anticipate the gates would completely fail within the next few years if no action were taken, exposing the surrounding area to the risk of tidal flooding from the River Thames. The Environment Agency confirm the flood defence project is unrelated to Thames Water's proposals upon which they recently consulted to use Barn Elms as a tunnelling site. A secure construction site will be created around the wharf for the duration of the works and a temporary road will run along the edge of the sports pitches to provide vehicle access to the site from Queen Elizabeth Walk. A small compound will also be set up in the southern corner of the playing fields. Some tree thinning works and the removal of overgrown shrubs along Beverly Brook are being undertaken now in preparation for the main engineering works. This has to be done in advance to avoid the birds' nesting season. Removing overhanging branches and shrubs will allow more sunlight to reach the brook, helping reeds growing in the shallow water to thrive. A healthier reed bed is important to stabilising the brook's silt levels and will improve the environment for fish and other river wildlife. Further landscaping and reed bed planting will take place later in the project. The Environment Agency does not need planning permission to carry out works to flood defence structures like Ashlone Wharf and has a right of access to the site through the playing fields. The council is working with the project team to ensure they cause a minimum of disruption to the sports facilities at Barn Elms' and residents living close to the site. Environment Agency officials are writing to homes in the surrounding area to explain the project and has agreed to hold site visits later in the year to further explain the nature and purpose of the works. Their newsletter is also available via the following link. For more information, and to register your interest in attending a site visit, contact the Environment Agency's project manager David Blythin on 01276 454705 or email david.blythin@environment-agency.gov.uk. This year’s Boat Race takes place on 26 th March starting at 1700. Full details of the crews can be found at http://www.theboatrace.org. There are suggestions of good vantage points from which to view the race and watch it live on a big screen, many of which are in Putney and would benefit from local support. http://www.theboatrace.org/article/watchingtherace/hostelries - There will be a market in Church Square and live music in many of the pubs and restaurants. Time banding restricts the times and manner that trade waste can be left on public pavements and footways in town centres. The aim is for businesses to liaise with their waste collection service to ensure that their waste is collected within a specified time band so that refuse sacks are not left on our pavements for long periods of time making the town centre look untidy and narrowing the already limited pavement space. This scheme has been introduced successfully in Tooting, Battersea and Balham and is now coming to Putney. The banding collection times affects only those business premises within the defined area where their waste is collected from the public footway, and not inside the premises. These planned improvements to the street scene come into effect on 14th March. Businesses will only be able to leave waste on the pavement between 9am and 11am and between 9pm and 11pm. Waste remaining on the street outside these banks will result in a £300 fine. Properties effected include 1-178 Putney High Street, 200-230 and 265-339 Putney Bridge Road, 1-9 and 2-18 Putney Hill, 1-29 and No 8 Lacy Road, 75-231 and 100-326 Upper Richmond Road and Keswick Broadway. Business Rates is a national tax collected by local councils and passed on to the government. It does not cover the costs of the collection of waste produced by businesses. This is paid for by local businesses and not out of residents’ Council Tax. The Census 2011 is coming. Sunday 27 th March is Census Day. Census questionnaires will shortly be delivered to each household by the Royal Mail and these can be returned in the envelope provided or the information can be provided on-line. The information provided in the census, which is kept secret for 100 years, is vitally important and will be used by the Government and local authorities to calculate the number of schools that will be required in the years ahead, as well as the number and location of hospitals, GP surgeries, and other community facilities. It is also used to prioritize the public transport requirements as well as housing needs. The Olympic cycling road races will go through Putney on 28 and 29 July 2012. The route will come over Putney Bridge, up the High Street, right along Upper Richmond Road and then along Priory Lane into Richmond Park and on to the Surrey hills. The cyclist will then return through Putney along the same route. The men’s race takes place on 28 July and the women’s race on 29 July with a gold medal for each race. 145 men will cycle 156 miles and 67 women will cycle 87 miles. Point Pleasant: Junction treatment works were carried out in February to improve visibility at the junction of Point Pleasant and Putney Bridge Road. The raised junction helps to slow speeds and facilitate ease of crossing for wheelchairs and pushchairs. The footways in Point Pleasant have also been improved. Routes 33 and 72: from Rock Lane, via Mill Hill Road, ahead Lower Richmond Road, Putney Common, back into Lower Richmond Road and Queens Ride to the line of route at Upper Richmond Road / Roehampton Lane. Route 265: from Lower Richmond Road via Queen’s Ride to line of route at Upper Richmond Road / Roehampton Lane. LUL track renewal on District Line of the tube will take place on 12 and 13 March when there will be no District line between Parsons Green and Wimbledon. Work will commence after the last train on Friday night and continue until the first train on Monday morning. Putney Bridge the western footway is closed at the junction with Lower Richmond Road for essential Thames Water works. Carriageway lanes are restricted north bound from Putney High Street to the approach of Putney Bridge and east bound on the Lower Richmond Road. Works will commence continue until 18 March. Woodlands Way footbridge Network Rail has closed the footbridge to pedestrian traffic for essential maintenance. The programme is scheduled for 9 weeks, ie until towards the beginning of May. Further information on roadworks can be obtained from Don Ogunyemi on 8871 6712 or email dogunyemi@wandsworth.gov.uk . http://planning.wandsworth.gov.uk/WAM/showCaseFile.do?appType=planning&appNumber=2011/0109 The Planning Applications Committee will shortly consider an application (2011/0109) by Waitrose to expand their Putney store. The new store will incorporate three of the existing units in Lacy Road and the side entrance to the Putney Exchange. A new emergency exit from the store will be created. The expansion will enable the store to provide additional stock and wider choice. Capsticks site, 77-83 Upper Richmond Road (Application No 2010/0054) http://planning.wandsworth.gov.uk/WAM/showCaseFile.do?appType=planning&appNumber=2011/0054 This scheme involves the demolition of all existing buildings and the erection of a new building comprising 3 blocks 12-13 storeys high (up to 41m), 4-9 storeys (up to 29m) and 1-2 storeys (up to 5.5m) to provide 104 residential units, office accommodation, retail, cafe/restaurant uses, together with a new public piazza, vehicular access, and basement car and cycle parking. The planning officer is Richard Evans on 8871 6644.
http://planning.wandsworth.gov.uk/WAM/showCaseFile.do?appType=planning&appNumber=2010/3019 This application is for renewal of the original planning permission granted in September 2005. A new application has subsequently been received for this site (2010/4520). http://planning.wandsworth.gov.uk/WAM/showCaseFile.do?appType=planning&appNumber=2010/4520 The proposal is of a similar form to the scheme that was previously refused and dismissed on appeal (2009/1773). The application is for the demolition of the existing building and construction of new building between 6 and 12 storeys (refused scheme was 8-15 storeys) to provide 69 flats (refused scheme had 89 units), roof terraces and balconies. 780 sq.m. ground floor commercial floorspace flexible use for Class A1 (shops)/A2 (financial and professional services)/A3 (cafe/restaurant use) or B1 (office use); 1500 sq.m. office floorspace (Class B1) at first floor; basement car park of 73 spaces (2 at surface level for car club). The case officer is Elma Vreken 8871 841. On 26 March, Trinity Hospice will be unveiling the latest addition to its highly successful retail network. A large new furniture and interiors shop will be opening on Putney Bridge Road (in former Sofa Workshop), close to the High Street. Customers exploring the store will be able to browse for furniture and soft furnishings in a relaxed and fun environment, knowing that money raised from sales enables Trinity to provide specialist end of life care to the local community. As with all Trinity shops, success depends on the generosity and support of the local community. For those interested in volunteering for Trinity, even for a few hours, you can email volunteering@trinityhospice.org.uk . If you have furniture that you would like to donate please contact furniturestore@trinityhospice.org.uk or call 020 7787 1058, to arrange a collection. This is a great opportunity for local residents to dispose of unwanted furniture and to help a good cause at the same time. Costa Coffee has opened a coffee shop in the foyer of the Odeon cinema. http://www.wandsworth.gov.uk/forms/form/173/report_licensing_matters or email us direct if you have concerns. Local events are published in the listings pages of Brightside which can be downloaded at http://www.wandsworth.gov.uk/brightside. Regular local events in Putney are given below. On 7 March between 5 and 7pm the Council is holding an arts grants workshop to discuss with individuals and organisations the process for applying from a grant for an arts project. It’s a drop in session at Putney Library www.wandsworth.gov.uk/artsgrants. Fibonacci give regular lunch-time concerts in St Mary’s Church. Programme details at www.fibsonline.co.uk. Putney Verse workshop takes place on some Sundays at 4pm at The Cats Back pub on Point Pleasant. Information from Connaire Kensit 8788 8647.